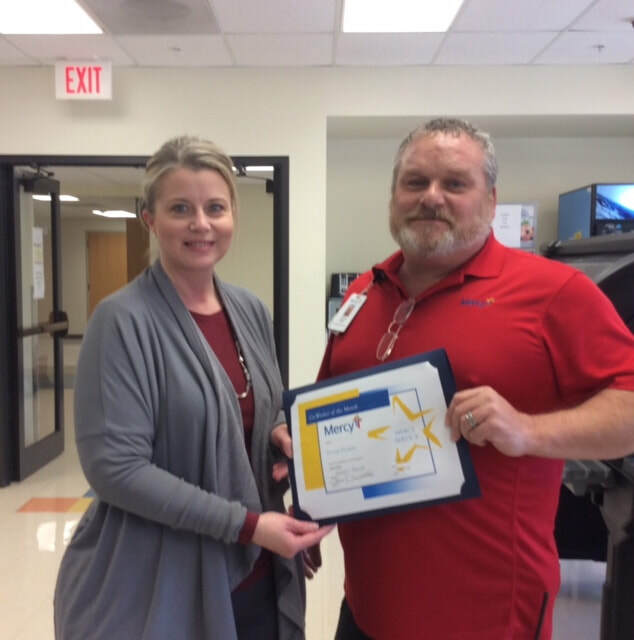 Donnie Dodson, maintenance technician, is Mercy Hospital of Cassville’s April Co-Worker of the Month. Donnie has worked for Mercy for 10 months. He resides in Purdy with his wife, Monica, who is also a Mercy employee in Rogers, Ark. They have five children and 11 grandchildren. Donnie enjoys fishing, hunting and going junking. He enjoys working for Mercy because of the family and Christian-based atmosphere, and he likes to help and interact with others. Donnie also stated Mercy is the only place he’s ever worked where every day is started with a prayer, something he feels is a good thing for this day and time. Pictured are Nicki Gamet, administrator, and Dodson.